Mookie Betts is on fire. 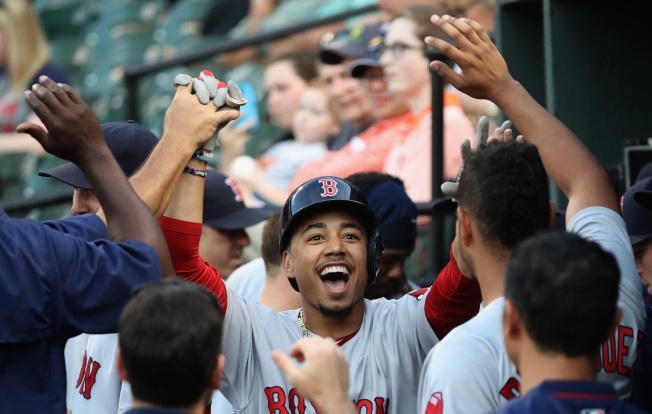 Just one day after hitting three home runs against the Orioles, the young Red Sox outfielder kept it going Wednesday night in a 13-9 loss in Baltimore. In his first two at bats, Betts hit two more. He now has five homers in his last seven at-bats, tying the MLB record for home runs in a two-game span. The 23-year-old set a major league record, becoming the first in history to homer in the first and second innings of back-to-back games. Betts was 2-3 with two walks Wednesday. He is now batting .288/.335/.549 with an .884 OPS. He has more plate appearances, at-bats, runs and triples than anyone else in baseball.